Quitting the rat race can mean different things to different people. For some it’s about following their passion rather than doing what they (believe they) have to do to pay the bills, for others it’s about not wanting to work at all. For me it’s about the freedom to work when and where I want to, still paying the bills, and having time to do other things – like being with my family, travelling, keeping fit, and creating passive income streams. I’ve always been a quitter, but not in the negative way we normally think of it. I quit university with six months to go on my degree when I was about 25 years old. I had already been running my first business for several years and knew that that was what I wanted to do. Getting a degree became irrelevant, so I stopped. I quit a great job that I really liked because I had outgrown it, and I found a better one. Three years ago, I quit the 9-to-5 world altogether, and now here I am writing this in my back yard at 3pm on a sunny afternoon. Quitting can be a good thing, if it means putting your energy into something more worthwhile. What does quitting the rat race mean to you? Please leave a comment and let me know. 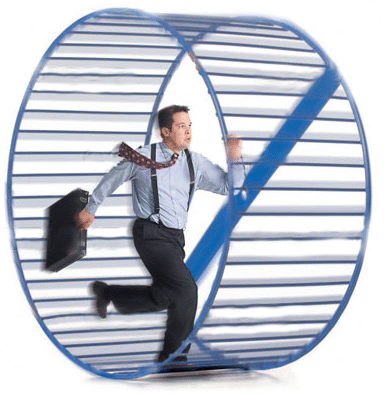 In my next post I’ll talk about what it would take for you to quit the rat race.